As a result of hail, some corn crops have been harvested for corn silage. Photo credit Troy Walz. To make a fair comparison, producers should make comparisons on a dry matter basis, and an energy or protein basis. Therefore, producers have to determine the dry matter content, the energy content (or protein content), estimated shrink of each commodity, and any trucking or labor cost associated with acquiring and using the commodities. To determine the cost of a dry matter ton, producers would take the cost per ton and divide by the decimal dry matter. ($41/.4 = $103 for corn silage), ($30/.25 =$120 for sugar beet pulp). Then to determine the value of the energy on a dry matter basis, take the cost per dry matter ton and divide by the decimal TDN value. ($103/.68 = $151 per ton of TDN on a dry matter basis for silage) ($120/.8 = $150 for sugar beet pulp). This does not include shrink, trucking or feeding cost for either commodity. 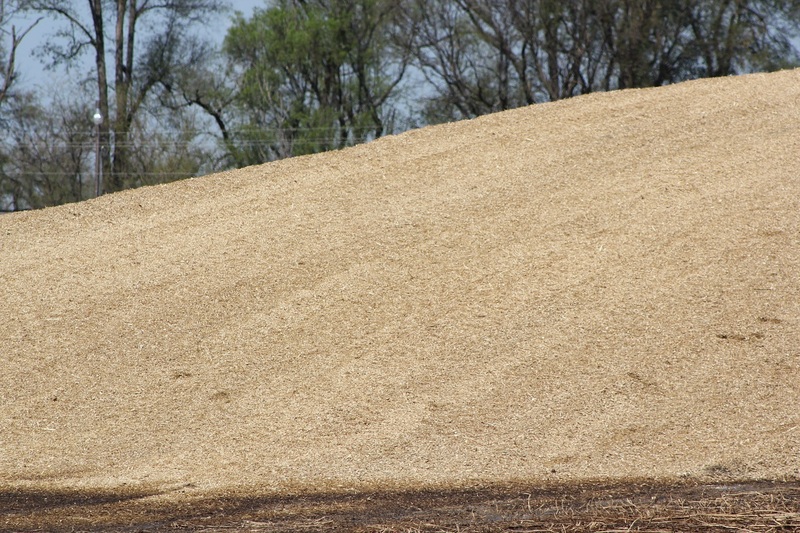 While the two commodities are the same price per ton of dry matter TDN, the amounts fed will be quite different due to the energy content of the feeds. Assuming a calf weighs 500 pounds and the desired average daily gain is 1.5 lb/d, this calf will require about 11% crude protein and 63% TDN in the diet. Feeding each 500 pound calf 5.5 pounds of alfalfa hay, 14 pounds of sugar beet pulp and 5 pounds of millet hay (as is basis) would meet the abovementioned requirements. Just substituting some silage for beet pulp would not supply this same energy level and therefore would not support the same level of gain. To achieve the same level of protein and energy and the desired level of gain, the corn silage would have to replace sugar beet pulp and some millet hay, which is of lower energy value than the silage. Therefore, 7 pounds of alfalfa and 17.5 pounds of silage (as is basis) would provide the desired protein and energy content. Metabolizable protein would be adequate in both diets. Therefore, producers would have to determine if substituting corn silage for some hay was feasible, and what the price difference would be. Producers needing assistance with ration balancing should contact Nebraska Extension Beef personnel. An August 2018 BeefWatch article discusses Making Silage from Late Season Hail Damaged Corn.